When Bang! came onboard with the project he introduced Ronin to the Lil’ pyro team, who created the short for Invasion. Originally, the movie was supposed to generate interest in the mapping contest by being released before said contest. The SFM team blew everyone away, offering a short movie that had a scope far beyond what had been originally planned. The 30 second teaser became a 3 minute trailer-style short movie with an in-movie movie, custom made props and particle effects, and even its own original score. But this vast expansion of the project meant the short took significantly longer than originally expected, and the Cosmetic Conquest Contest - with a hard, pre-established date - was launched without the short and the movie was instead saved for the launch of the update. If I told you to create 3 minutes of high quality SFM - and I mean, good, cutting edge SFM animation here - how long would you guess it would take? A week? Two weeks? Four minutes? Twelve lightyears? One hundred and eighty! I’m just shouting numbers now. 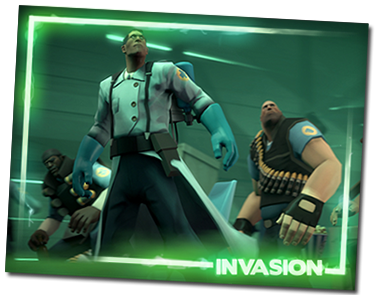 In actuality, It took 6 people several months to create the final SFM short that announced Invasion. CobaltGemini, the SFM lead, was introduced to Ronin along with the rest of the Lil’ Guardian Pyro team and Ronin was happy to give the team full creative freedom. The animation was primarily done by CobaltGemini, who takes stiff and somewhat clunky computer generated models and gently breathes life into them. The art of animation is not for the faint of heart. It takes many painstaking hours, starting with lifeless bodies and the vaguest of sketches of how the models might be placed in the environment. 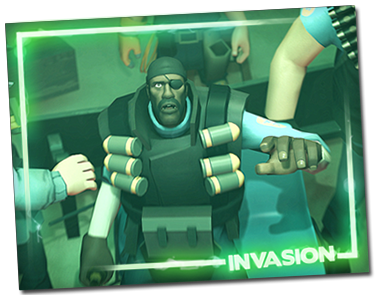 Slowly, CobaltGemini grafts movement onto them, making the Demoman sit with his shoulders and arms at just the right angle to show his annoyance with the the dreadful 3D glasses, or making the interaction between the Heavy and Medic fit the characters, but subtle enough that it doesn’t scream “I AM EMOTING AND ACTING, ALL AT ONCE” at you. Slipping into Uncanny Valley (a term used for when things look almost right, but are just wrong enough that the final result is oddly creepy to look at) is a common pitfall, but CobaltGemini deftly steers characters we know and love through that valley and out the other side. Harry101UK did the sound design, which is typically an under appreciated art. When a sound designer does his job well, the audience most likely won’t notice it at all. Harry101UK’s job was to find sounds for all the things that happen in the SFM, synchronize them accurately, and weave them carefully into the background of the movie. Often, sound designers have to get creative. Using the “correct” sounds are often surprisingly unsatisfying to the audience. For example, in a lot of hollywood movies, the sound of rain in the background is actually the sound of bacon sizzling. Incidentally, this also implies that at some point in history, someone was desperately wracking their brain, trying to figure out how to make sound effects while cooking breakfast. Harry101UK pours through libraries of sounds and makes the silent void of an SFM vibrant; the crunches of footsteps, the creaking of the barn as it gets destroyed, the whir of the projector. If any of these were absent, a lot of people wouldn’t even know what was wrong with what they were watching, but it would just feel empty. What’s more, if a sound is too loud or too soft it ruins the feel of it, forcibly jarring the viewer out of their suspension of disbelief. If you’ve never heard of it before, these background sounds are called “Foley”. Impress your friends with this mostly relatively useless bit of trivia! Especially if any of them are named “Foley”. Fitting foley to the movie is a relatively thankless job, but Harry101UK does it wonderfully. Go and rewatch the SFM and really listen to it and appreciate all the little sounds you might have missed. Wonder at whether the barn creaking is just one sound… or actually 9 different sounds cleverly interwoven to seamlessly make you believe that it really is being ripped apart. Now, no movie is complete without a sound track. Soundtracks really are a modern lynchpin of making hearts soar, stomachs flutter and tears fall. For Invasion, this job belongs to Hassan. Hasan “Hasan2300” Abdullah’s job was to inject the movie with emotional cues that bring the magnitude of what’s happening on screen home. Hasan was originally brought onto the Lil guardian Pyro team by Harry101UK, who actually lived with him whilst he was working on their team’s namesake SFM, which went on to win the 2013 Saxxys. One of the most difficult things about creating a score has got to be making it so that the music matches, beat for beat, exactly what happens on screen, but not overwhelming people watching it. If you keep the intensity up too long, it tires people out. Hasan brings the music up and down and then back up again with tremendous style, but simultaneously keeping it within the established style of the TF2 universe. My personal favourite moment in the musical score is at about 2:00 minutes in when the music, which was building toward a crescendo, suddenly releases into a John Williams-esque swell of strings and wind instruments, bringing a moment of a calm child like wonder amidst the chaos. 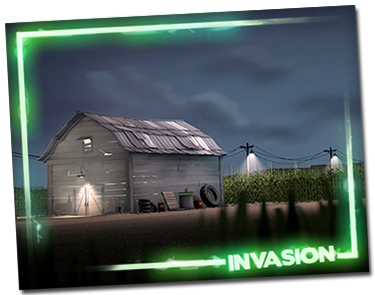 You may have noticed that the barn the map stands upon is not a normal TF2 map. Nor is it a map that was on the workshop. A bit like how a film crew will create a set for a Hollywood movie, Bang was tasked with quite literally setting the stage, making a map specifically for the short film. He then populated it with a number of custom props and assets, filling in the little details most people wouldn’t notice to make sure the set felt neither too crowded nor too empty. Also, it turns out that “breaking an entire barn apart” is, regrettably, not a specific function in Source Film Maker. Bang was the puppetmaster who made the barn debris from the barn rip itself apart, peeling away from its own structure before floating with a haunting grace, like flotsam from the wreckage of a ship, before it comes crashing down around the ears of the mercs, spilling its contents onto the floor. Like a lot of hollywood magic, when done well you quickly forget that someone had to put in the hard graft to make even the small details work. 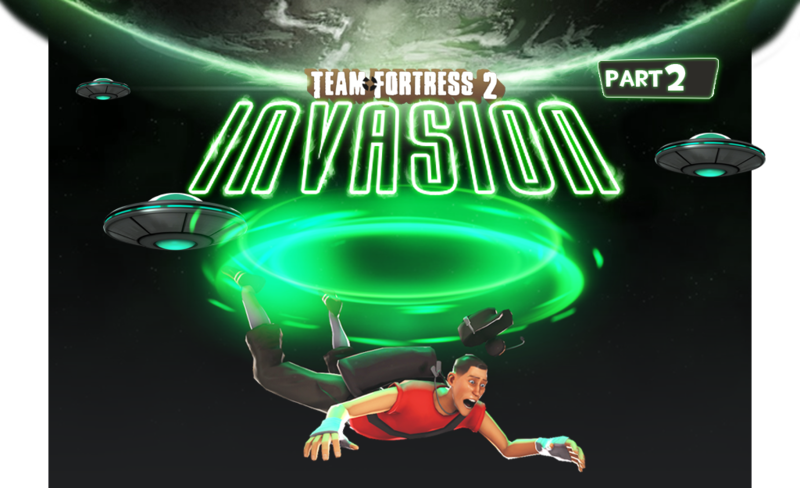 It was actually during the development of Invasion that Valve released the taunt workshop. End of the Line had been the first community update to get a taunt in - the Pool Party. This made the team take note and think of the vast possibilities of an alien themed taunt. In the end, one idea immediately sparked the development of a taunt that is similar to, but legally distinct from, a certain well-known movie involving aliens. Each class who uses this taunt has a different animation based on their personality. The Heavy tries to beat it back into his chest, while the medic studies it and the pyro gives chester a gentle pat on its head. Oh yeah, His name is chester. When kritzkast was tasked with creating an audio drama featuring Aliens, one previous production lept to all of our minds: The 1938 audio drama of War of the Worlds. Instead of merely reading the novel, or following the characters in the book, the original radio play followed a radio station reporting on the events of the book as they transpired. Contrary to popular belief, people did not believe that the events actually took place.....So, we had a target to beat. Realising its close approximation to the TF2 timeline, it seemed like a no brainer. It is chocked full of references to Team Fortress lore - including one referring to the as-yet unreleased End of the Line - as well as a large amount of hidden extras. The original audio play was over two hours long, but - due to time restraints, and in the interest of listener sanity - our three parts lasted between 10 and 15 minutes each, leaving about 40 minutes of content in total. Artwork for the Advertising in the audio drama, seen above, was also created by Freeflow. This was going to be part of the asset pack for the mapping contest to help tie everything together; however, due to the audio drama being kept back until release, they weren't used. The aims of Day 2 were to reveal the existence of the aliens officially, and to show how the world at large was attempting to cope with them. The characters were built upon a bit more in an attempt for the listener to “care” for the main characters and how they would survive an alien invasion. 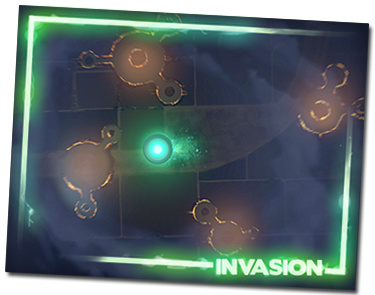 Near the end of the radio play, there was a call for mapmakers to make alien-themed maps for the update. This originally would have been revealed before the map making contest to hype people up for creating alien themed maps. Later it would have been used to reveal any maps included in the update.